Gemini Rue, an upcoming indie title for the PC, looks like something we sadly haven't seen much of lately: a game that combines adventure, science fiction and a little bit of darkness. While that sounds like the nichest of niche genres, throughout the late 1980s and into the 1990s there was actually a steady stream of quality titles that fit just that bill. 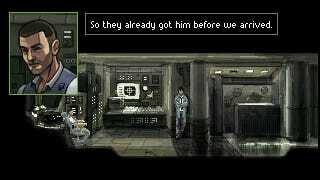 Some were trying to be Blade Runner, one was Blade Runner, but all of them shared some common elements: they were adventure games, they were set in the future and had a dark, almost noir tone. So, yes, quite a little fad we had going there for a while! One more thing all the games above had in common is that they're great, so seeing Gemini Rue has put a big smile on our faces. Gemini Rue, which won the Student Showcase award at the last Independent Games Festival, is an adventure game featuring things like hand-drawn backgrounds and visuals that look like they came straight out of 1995. And we mean that in a good way. It'll be available later this year, but you can pre-order it now from the developer's site if you like what you see.